In case you missed it as part of the announcement earlier this week, if you complete any five of the brand new GTA Online Freemode Events or Challenges by Sunday, you'll get GTA$50,000 bonus in-game cash plus the exclusive Vapid t-shirt for your in-game character. 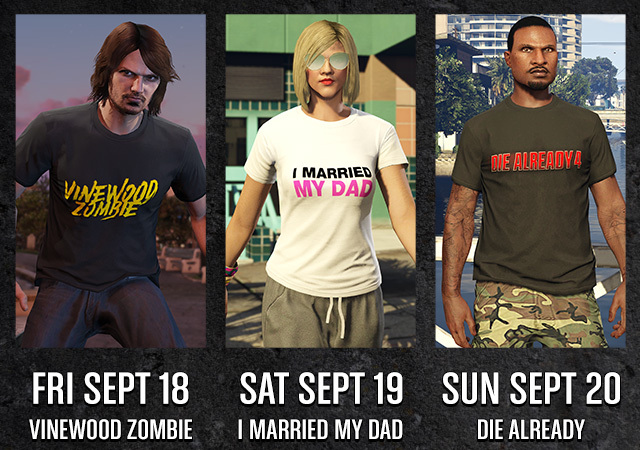 The GTA$ and t-shirt will be awarded to your GTA Online character by Friday, September 25. To make sure you're properly prepared to wreak havoc in Freemode Events like Hot Property, King Of The Castle, Hunt The Beast and others, Ammu-Nation is bringing out the heavy artillery this weekend, slashing prices by half on the Heavy Sniper, Micro SMG, Carbine Rifle and Minigun, as well as all ammo. And protect yourself from insidious onslaughts this weekend with half off on Armor, Bulletproof Helmets and Bulletproof Tires. With the action coming thick and fast, sometime the best way to get by is with a little help from your friends. You may need to lose a pesky Wanted Level or call for a Helicopter to chauffeur you to the Freemode Event location. You also want to maximize your chances in Hot Property or King Of The Castle by arriving on the scene in a Lazer - or perhaps have your Buzzard Attack Chopper delivered nearby to ensure you've got the best perspective on the runaway Beast. For these possibilities and more, all Pegasus and Merryweather Phone Services are discounted by 50% this weekend, along with Lester's Remove Wanted Level service to guarantee you're never hindered in taking part in the next Freemode Event. Specifically for Xbox 360 & PS3 players this weekend, Rockstar is increasing the frequency on all kinds of classic Freemode occurrences, including Armored Trucks, Kill Targets and High Priority Vehicles - with lucrative rewards upon completion of each. Amidst this mayhem, special Event Crate Drops will also be descending from the skies on Xbox 360 & PS3, with exclusive t-shirts that you might have missed out on in previous Events. The celebrate the world-spanning nature of these GTA Online Freemode Events Update, the Social Club Weekend contest features a collection of GTA merch that's representative of what Los Santos and Blaine County has to offer. It includes a Merryweather T-Shirt, Los Santos Lifeguard T-shirt, GTA V Epsilon Paperweight, GTA V Loneliest Robot Greeting Card, GTA V Lifeinvader Mouse Pad and Rockstar sticker packs as well. To enter for your chance to nab the gear, head over to the Social Club Events Page and hit the Enter Sweepstakes button in the lower right corner. Also stay tuned for the first Rockstar Editor contest for PS4, Xbox One and PC to be announced sometime next week - giving all the new budding directors on PS4 and Xbox One some time to polish those editorial skills before the gauntlet is thrown down. Have fun and join the chat in the forums! 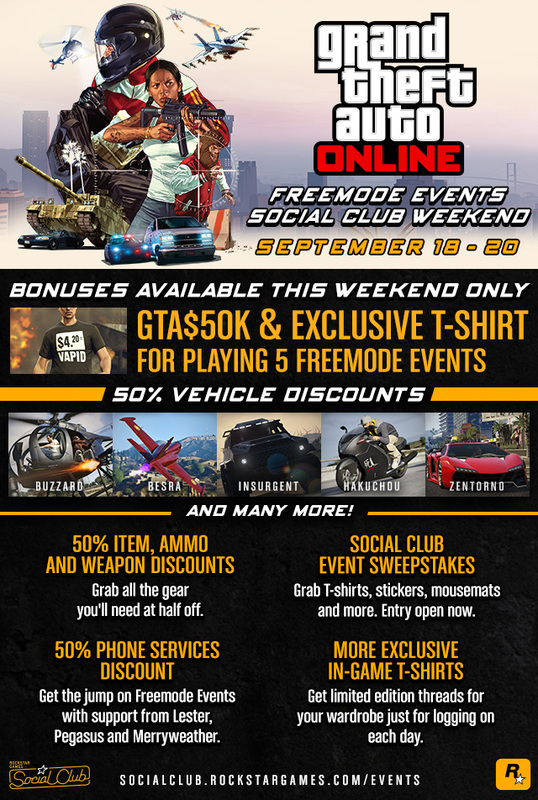 Freemode Events Weekend - Plenty of discounts and bonuses this weekend to celebrate the Freemode Events Update.